I'm thrilled with today's Asian treasure finds, among them, this authentic, original Qing Dynasty Jiāqìng period Famille Verte charger plate, circa 1796 - 1820, with a butterflies and gourds motif. 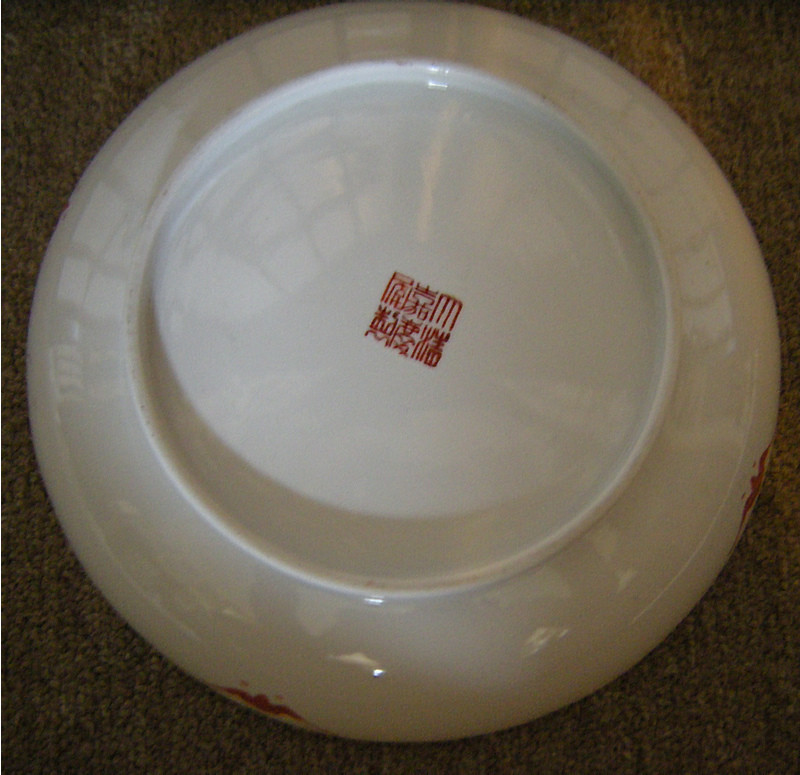 It is marked with the traditional zhuanshu seal of the period, 大清嘉庆年制 , Dà qīng jiāqìng nián zhì, and is in near mint condition. The back has 4 red bats. 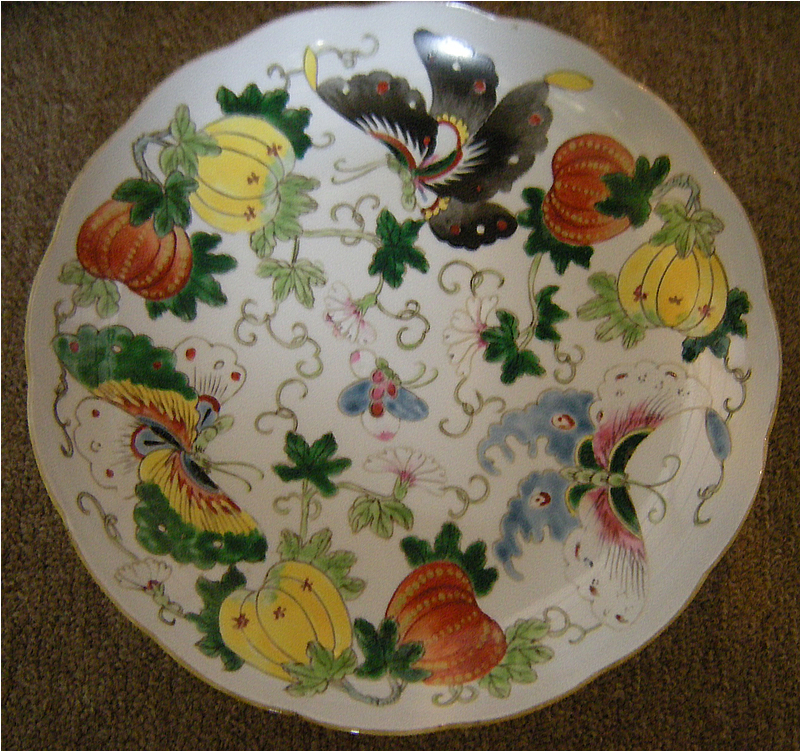 The motif of butterflies and gourds are a favorite design on Chinese enamelled wares. Butterfly ( dié 蝶 ) and gourds ( guā 瓜 ) represent the wish for many sons and grandsons (Guā dié miánmián 瓜瓞 绵绵 ). The thousands of seeds found in gourds symbolize the wish for ceaseless generations of descendants. 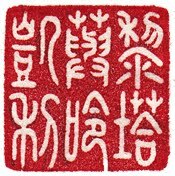 According to Teresa Tse Bartholomew in Hidden Meanings in Chinese Art, San Francisco, 2006, p. 62, the term 'guadie mianmian' comes from the Book of Odes which is one of the earliest collections of Chinese poetry. In classical feng shui applications, the bat is considered a symbol of wealth and used as a wealth cure because the same word/pronunciation for Bat is "fu", which also means "Prosperity" in Chinese. Bat also came to represent happiness and longevity, so it is an auspicious symbol in Chinese culture. 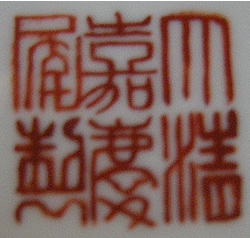 The bat (fu 蝠) is a representation of "good fortune" or happiness (fu 福) because both characters are pronounced fu. Often the bat is shown flying upside down because the character (dao 倒) for "upside-down" and the character (dao 到) meaning "to have arrived" are both pronounced dao. Therefore, if a person were to say "the bat is flying upside down" a listener could just as easily hear this as "happiness has arrived" which, of course, has a very auspicious connotation. Also, "a bat descending from the sky" (fuzi tianlai 蝠子天来) sounds exactly like "happiness descends from heaven" (fuzi tianlai 福子天来). Two bats facing each other mean double good fortune or happiness. In the Mandarin Language, a bat is called Biānfú , 蝙蝠 which is homophonous with Biàn fú, 變福 which means “becoming prosperous” or “turning into blessings”.